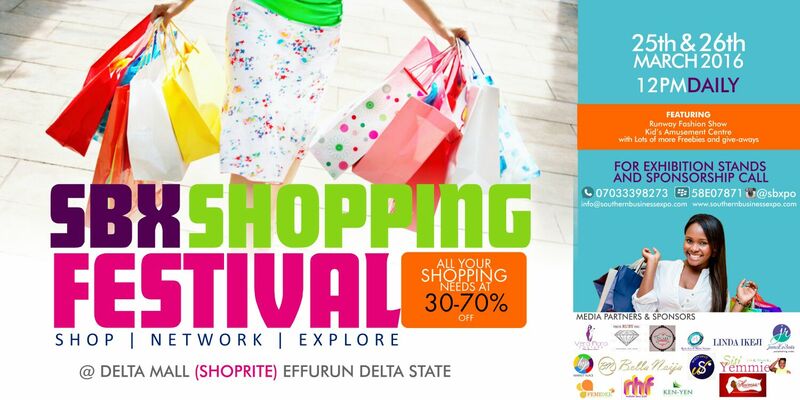 THE SBX SHOPPING FESTIVAL TAKES PLACE IN WARRI THIS EASTER WEEKEND! All roads lead to Warri this weekend...Area!!! Do You offer any Service? Do You have a Brand You wish to Launch????? This is Your Opportunity to EXPLODE! With This Year's venue; The Delta SHOPPING MALL (SHOPRITE), Warri, Delta state we are Expecting over 10,000 SHOPPERS! Boutique owners, Fashion houses, kiddies stores, Beads and accessories retailers, Gifts/Souvenirs, Cake makers, Caterers, Cocktails, Bride and Groom stores, Makeup brands/Retailers, Cosmetic companies, Fabrics merchants, Perfumery, Hair Merchants, Gadgets, Electronics, Interior décor, Households, Travel, and many more are going to be exhibiting this weekend. Here's the cost of Exhibition, so book a slot now!